Thank you for your interest to improve your schoolyard! 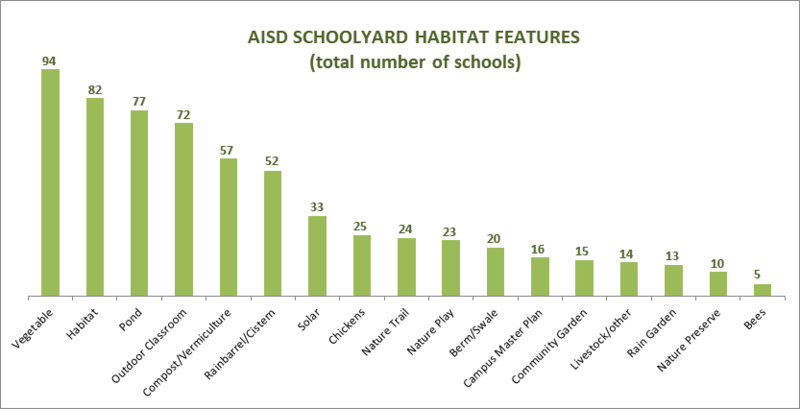 Austin ISD recognizes the many benefits that come with connecting our students to nature. Garden based learning improves grades, knowledge, and attitudes/behavior in Elementary, Middle, & High School levels. 92% of students in classrooms that integrated the environment had higher standardized test scores, GPAs, and enthusiasm for learning. High School students with views of trees and bushes from their cafeteria windows had higher standard test scores, higher grad rates, and higher percentage of students planning to attend a 4-year college. Gardening at schools helps students feel proud, responsible, & confident. Green schoolyards promote physical activity by offering a variety of active play options that engage children of varying fitness levels, ages, and genders. Before implementing your project, please follow the steps below to submit your Schoolyard Improvement Project Review form. The purpose of this form is to approve the location of your project, and to ensure you receive relevant information regarding future site developments, underground utility lines, and potential resources to help you and your team plan and implement the project. The form should be submitted by the School Principal or someone they designate to submit on their behalf. The review committee meets twice a month, and please allow four weeks for review and approval. Please do not begin your project until you have received approval. Submit the Schoolyard Improvement Project Review Form. Submit a Work Order to Grounds through the school's administration office to flag your application for review. What type of projects require submittal of the Schoolyard Improvement Project Review Form? Use this form for projects such as veggie gardens, raingardens, pollinator gardens, tree planting, greenhouses, chicken coops and animal-related structures, apiaries, cisterns, and playground modifications. Not sure if your project qualifies? Email schoolyardimprovement@austinisd.org. What if our school is working with a donor, service provider, vendor, or community volunteers for our Schoolyard Improvement Project? This is great! All partners are required to follow the AISD Partnership Process. The Schoolyard Improvement Review Committee can still review your form to ensure the project location is suitable, but you will need to ensure the AISD Partnership Process is complete before site work begins. Where can I find City of Austin regulations relevant to my schoolyard project? Visit the City of Austin's online search engine and enter any keywords relevant to your project (bees, trees, domestic animals, cisterns, etc.). The applicant is responsible for ensuring the project meets all city regulations, codes, and ordinances. Where can I find info about 2017 Bond work to help me plan my project? You can find thetiming and scope ofbond-related projects at your schoolto ensure future construction work will not impact your project. Changes to the building: including but not limited to new flooring, resurfacing of wood gymnasium floors, replacement of blinds, roofing repairs, HVAC repairs and drainage system improvements. For this type of work, visit AISD Construction Management Campus Support. Sports field equipment. Contact Austin ISD Athletics.